There are two up-and-coming pulse crops in Saskatchewan that are particularly noteworthy right now. Faba beans are a great option for growers in the northeast of the province, who have had trouble with their pea crops due to wet conditions, says Saskatchewan Pulse Growers' (SPG) Agronomy Manager Sherrilyn Phelps. "The nice thing with faba beans is that they are resistant to Aphanomyces root rot and more tolerant to wetter conditions, so they are a good fit for areas that have had trouble growing peas," she says. "Growers are recognizing the value of having a pulse in rotation and they are looking for pulse options, but we just have not had great options until faba beans came along." Faba beans are also exciting due to their nitrogen fixing capability. They are the highest nitrogen fixing grain crop, with the ability to fix about 70-90 per cent of their nitrogen needs, Phelps says. "This is huge considering that faba bean yields can also be quite phenomenal. Under the right conditions, we have seen yields of over 100 bushels an acre, which leads to a lot of nitrogen fixation. You also see advantages the following year in terms of nitrogen and non-nitrogen benefits." Soybeans are also promising for Saskatchewan, in that they can be a relatively easy crop to grow, are suited to wetter conditions, and markets are well established, Phelps says. But these two crops face some distinct challenges for growth in Saskatchewan, which SPG is aiming to address. One of the major challenges for soybeans is the short growing season in Saskatchewan. For soybean varieties to be successful in Saskatchewan's climate, they must be well adapted to long days, low night temperatures, and a short season. Warkentin is currently working on a project that aims to develop soybean varieties suited to grow in Saskatchewan's conditions. He has been testing germplasm developed by Dr. Elroy Cober, a Research Scientist with Agriculture and Agri-Food Canada who developed soybean populations in Ottawa using early maturing parents, and sending them to Saskatchewan and Manitoba to be tested locally. "I have been making selections from these populations for the last few years and then advancing the good ones and testing them," Warkentin says. "We have material now that looks quite promising in terms of earliness and yield. I do not have a variety to talk about yet but we think there is pretty good promise." 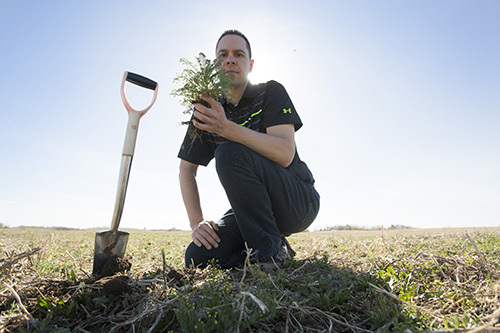 Another challenge when it comes to growing soybeans in Saskatchewan is weed control, says Dr.Chris Willenborg, a Researcher and Assistant Professor in the U of S's Department of Plant Sciences. "Soybeans are not a very competitive crop, which is one of the major reasons why they were selected as a crop in need of herbicide-resistance traits," he says. "Weed control was made easier by these systems, but with resistance having now evolved, weed control is becoming more challenging in soybean." Adding to the problem is that Western Canada produces a lot of canola, which can be a major challenge to control in soybean crops. "Volunteer canola can emerge throughout the growing season, and timing of emergence has an impact on weed control. Moreover, if the canola was glyphosate resistant, the volunteers will not be controlled in glyphosate-resistant soybean without additional measures." Willenborg is currently wrapping up research aimed to help manage volunteer glyphosate-resistant canola in glyphosate-resistant soybean crops. Overall the research found that the best control method is a combination of pre- and post-emergence treatments, in other words, layering herbicides using a combination of products applied at different times of the year. The best herbicide layering combinations from Willenborg's research were either Express®/ Basagran®, Heat®/Viper®,or Express®/Viper® as pre-/post-emergence applications. The solution for weed control in soybeans is not only herbicides, Willenborg says. Another study he was involved in examined impact of seeding rate and seeding date on volunteer canola management and found that early seeding generally improved the competitive ability of soybeans, but did not always result in higher yields. "The optimal seeding date to best manage volunteer canola appeared to be the third and fourth week of May," he says. The same study also concluded that the best seeding rate for soybeans to provide some competition to the volunteer canola ranged 44-57 plants per metre squared (m2). This seeding rate is just slightly higher than the current recommended seeding rate of 40-45 plants/m2. "Interestingly, we found that with a volunteer canola population of 30-40 plants/m2, even the highest seeding rate of 160 plants/m2 was still producing increases in yield," he says. This means that, in situations where soybeans are competing with weeds, there is value in increasing soybean seeding rates, but only up to a certain point, he says. "Increasing seeding rates to target 60 plants/ m2 really only paid when soybean prices were high." Overall, Willenborg says that the best approach to weed management does not involve just one or two methods - a more integrated approach is always the best solution. This is the focus of a research project he is currently working on, which aims to determine how we can better manage herbicide-resistant weeds in pulse crops and use integrated solutions to improve control and reduce costs for growers. This research will wrap up in 2021. It is well known that pulses contribute to soil health, but many researchers are looking to delve into this issue more deeply. Dr.Jeff Schoenau, Professional Agrologist and a Professor in the U of S Department of Soil Science, is one of these researchers. He is currently wrapping up a research project, done in collaboration with Dr. Tom Warkentin, which compared nutrient uptake and content of short-season soybeans to peas and lentils grown in Saskatchewan. The research also looked at how the residues of these crops contribute to the nutrition and yield of subsequently grown wheat and canola crops. The trials were carried out across four sites in the Black and Dark Brown soils zones in Saskatchewan, using three modern varieties of each of the crops. The results showed a promise for soybean production in Saskatchewan, says Schoenau. First, while peas tended to be the highest yielders, soybeans were not too far behind. They also had similar rates of nutrient uptake as the other crops, and proved to be good nitrogen fixers. "The proportion of nitrogen derived from the air through biological nitrogen fixation by the Rhizobium in the nodules was similar to or even a little bit higher than what we saw for the other pulse crops, and I think that we achieved that because we double inoculated the soybean crops," he says. "That is important for soybeans because if soybeans have not been grown before and an inoculant is added, there is very little Rhizobium of the correct species to carry out symbiotic nitrogen fixation with soybean in our prairie soils." They also found that soybeans had a higher concentration of phosphorus and potassium in the grain compared to peas, according to Schoenau. "The nutrient export potential through crop removal tended to be greater for soybeans compared to the other two pulses grown under the same conditions. That is something to be aware of when soybeans are grown over a number of cycles of a rotation - there is a potential for greater depletion of soil phosphorus and potassium with soybeans." They did not observe any large differences amongst the different pulse crops in terms of releasing nutrients to the subsequently grown crop or on yields of the subsequent crops in their three-year study. 'We observed similar short-term effects on yield and nutrients in the following crops, which suggests that in the short-term, nutrient requirements for wheat and canola following soybeans are not that much different than what we would expect for the other pulse crops we evaluated," Schoenau says. Other on going SPG-funded research is focused on establishing best agronomic practices around soybean production, in the areas of phosphorus management, irrigation, and nitrogen management. There has been a lot of recent interest in faba beans as an alternative to other pulse crops. The crop offers many benefits such as a high yield potential, and large amounts of nitrogen fixation. But not a lot is known about the nutrient requirements of modern faba bean varieties grown under Saskatchewan conditions. To address this knowledge gap, Schoenau is currently conducting field research in collaboration with Dr. Bert Vandenberg of the Crop Development Centre that ultimately aims to provide Saskatchewan growers with more information on the amounts of plant nutrients required and removed by faba beans in rotation, and to help growers make better decisions around fertilizer use in rotations containing faba beans. Although they just completed the first field season of the study, there are a couple of early observations. Faba beans do in fact have a lot of nitrogen in the above-ground plant material, and a huge proportion of that nitrogen is contained in the grain, Schoenau says. They also found that faba beans have a very high phosphorus requirement, which is associated with the high yield potential of this crop. "Again, like nitrogen, a very large proportion of the phosphorus is in the grain, which is removed in harvest, and there actually is not a lot left behind in the straw. That is a bit different than what we saw for other pulse crops that we evaluated In our other study," says Schoenau. The study is currently heading into its second season of field trials. 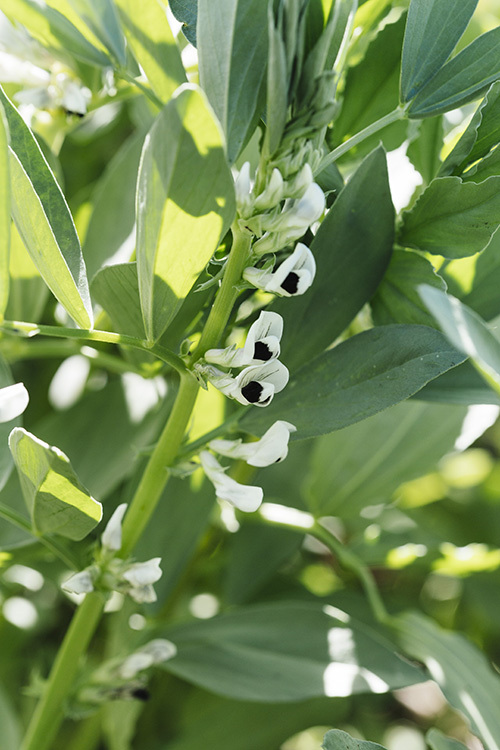 In terms of agronomy, there are several challenges to growing faba beans in Saskatchewan. Dr.Diane Knight a Professor in the U of S's Department of Soil Science and Saskatchewan Ministry of Agriculture Strategic Research Chair, began addressing some of these challenges when she first began her SPG-funded faba bean research in 2013. The research project she led explored options for a commercial inoculant for faba beans. She began by accessing several different collections of Rhizobium, some locally sourced and some from the United States, and screening them for their ability to nodulate and fix nitrogen with two faba bean varieties, one large-seeded and one small-seeded. From there, she was able to begin narrowing down the Rhizobium options until there were only two strains remaining. "One of the cool things was that the different cultivars of faba beans - small and large-seeded - actually worked the best with different Rhizobium strains, so we were able to pick one that was good for the small­ seeded and one that was good for the large-seeded," Knight says. This was an important lesson learned, she says. "People tend to think that all crops are the same, irrespective of what the cultivar or genetic line is, but this gave us some evidence that this is not really true. As we are breeding and changing plant varieties, maybe we need to be looking at pairing up the more effective Rhizobium with those different lines." Now Knight has progressed to the second phase of this research, which involves taking her findings out into the field for further testing. Last year was the first year of the testing, so it is too soon for results just yet, but Knight feels that the research will yield results that will improve market options for all Saskatchewan-grown crops. "Increasing the nitrogen-use efficiency of a production system by including efficient nitrogen-fixing crops like faba beans should Increase the marketability of all Saskatchewan grown crops on a global scale," she says. Several other SPG-funded research projects are also aiming to help nurture the production of faba beans in Saskatchewan. Some of these projects are looking to determine best agronomic practices around growing the crop, such as optimal seeding rates and dates, disease management practices, irrigation treatments, and inoculation options. Another project aims to learn more about chocolate spot, a disease that affects faba bean crops in Saskatchewan, and will likely continue to grow in importance as growers produce more and more of this crop. One of the main challenges with faba beans is on the marketing side, says Phelps. "The big challenge for faba beans is understanding where the potential markets are and how best to access those," she says. For this reason, SPG invested in market research looking at opportunities for Canadian faba beans in world markets. The study aimed to better understand production and market demand for the crop, in order to determine where there is opportunity for growth, and opportunities for Saskatchewan to meet that growth. The results of this study have helped SPG narrow down its strategy to help develop emerging markets for faba beans. For example, the results showed that while the production of faba beans has grown impressively over the last three years, the market for domestic food use does not offer the greatest opportunity for development. Other potential marketsfor the crop hold greater opportunity. One of these is the fractionation market, which is still in its infancy. In order to help develop this potential market. SPG is currently funding research in this area, such as the project being led by Dr. Shannon Hood-Niefer, Scientist and the Vice President of Innovation and Technology at the Saskatoon Food Industry Development Centre. "I believe faba bean is the next big pulse crop, from a food processing point of view," she says. "It is bland in flavour, higher in protein, and has a neutral colour, so it is easier to work with." There is currently a lot of interest in the crop from the commercial food industry, she says. "Some of the larger multinationals we are working with are very interested in faba beans. We are doing a lot of new food product development dealing with higher protein levels." Dr.Hood-Niefer is currently leading a three-year research project that aims to help food companies better understand how and why to include faba beans in their products. The research began by analyzing 10 different varieties of faba beans, and they found that protein content ranged from 25.2-28.9 per cent. This is the big sell for food companies, Dr.Hood-Niefer says, as consumers are currently looking for foods with higher amounts of protein. "Say you are making bread and you only have 20-30 per cent room in your formulation to do a supplementation with a pulse product. If you were to choose a faba bean flour instead of a pea flour you would have higher protein content," she says. "Food manufacturers are really looking at those protein numbers. It makes it easier to get to a level where you could potentially make a protein content claim." Now the research is exploring what percentage of faba bean ingredient can be added to food products without affecting the taste or functionality. Another important element of the research is minimizing the risks involved with the vicine and convicine levels in faba beans. These compounds can cause an acute, negative reaction in some populations of people who suffer from a pre-existing condition.The prevalence of this pre-existing condition has not been studied in North American populations. To help with this, there is a toxicologist involved in the project to help determine how processing faba bean impacts its vicine and convicine levels. The next phase of the research will involve making actual food products, which will then be analyzed for functionality and taste, and will undergo toxicology testing. The research is set to wrap up next year and Dr. Hood-Niefer hopes to then have concrete results to take to food companies. "I think once we get over the hurdle of vicine/convicine, we will see faba beans take off as one of the pulses that is easy to work with."